The ‘834 patent allows for people to join in or leave a game without having to restart the current session. The patent is exemplified most notably in squad-based shooter games where player, while attempting to achieve objectives, come and go at their on their own free will. 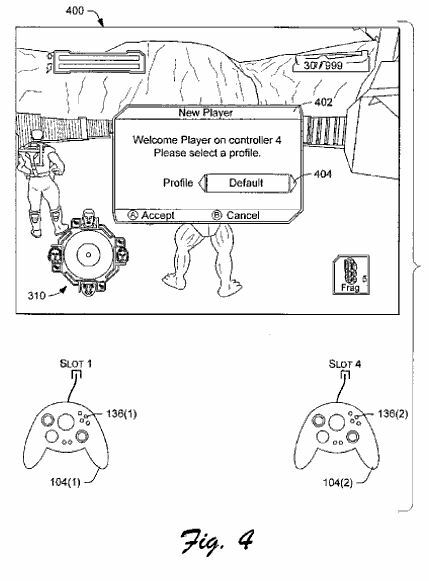 Under the patent, whenever a new player connects a controller to the game consol, the image on the screen is split so as to allow the new player access to the game with his own screen and point-of-view. Before the new player enters the game, a menu appears informing the players that a new player is about to join. Once the new player joins into the game, he is allowed to pick from any of the available characters in the game. Whenever a player wishes to leave the game, he can do so without a problem. The player exits the game, the other plays are informed of his departure, and the artificial intelligence takes back control of the player and the game resumes. A squad-based shooter video game allows players to dynamically join and leave the game, while that game is in progress, without the players having to save and restart the game. When a new player joins an in-progress game, a new squad member is allocated to the new player and the screen is split to present a viewing panel for the new player that depicts scenes from the perspective of the new squad member. When an existing player leaves the game, the screen is unsplit to remove the viewing panel for the exiting player and that player’s squad member becomes part of the squad being controlled by the remaining player(s). 1. A method implemented at least in part by a computing device comprising: facilitating play of a game played on the computing device, the computing device comprising a physical game console, by at least one existing player; detecting, by a processor of the physical game console, while the existing player is playing the game, a join condition indicating that a new player would like to join in playing the game, wherein the join condition is generated as a result of the new player connecting a game controller to the physical game console; upon the processor detecting the join condition, the processor automatically splitting an image displayed on a physical display to present multiple viewing panels such that the existing player views action through a first viewing panel and the new player views action through a second viewing panel; and the processor facilitating play of the game by the existing player and the new player.